If you're reading this, you're probably on your phone looking up the best Sterling Heights carpet installers online. Well, your searching stops here, because the installers you need work for The Carpet Guys. By scheduling a free in-home estimate, you gain the option to shop at home. One of our friendly representatives will come out to your home with multiple samples to choose from. A customer should never be pressured into making a decision. If you require extra time to make a final decision, take as much as you need. We offer the best carpet specials that you can find. Appointments are available for scheduling seven days a week including evenings. For those who are interested, we can provide complimentary decorating advice to match your new flooring. We offer affordable carpet prices on high-quality brand name products. Next-day carpet installation is availabile for our in-stock merchandise. With thirty years of experience backing us up, our carpet installers are licensed and certified to provide superior craftsmanship. We remove the unnecessary stresses and anxieties from the procedure of buying new carpet. Let The Carpet Guys take care of your Sterling Heights carpet installation needs. Our goal is to provide the best carpet services possible and guarantee your satisfaction. With our service, you don't have to worry about finding a trustworthy carpet installer or stress out about expensive carpet prices. 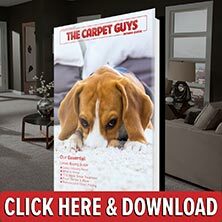 Take some time to fill out a free in-home carpet estimate and get started on renovating your home with fresh and beautiful carpeting. With us, you can rest easy knowing that your home is in good hands. Schedule an estimate via our website or call in to speak with one of our friendly representatives. Sterling Heights carpet installation has never been so good.